Many vegetables can get a head start in your garden with a little protection from the cold. 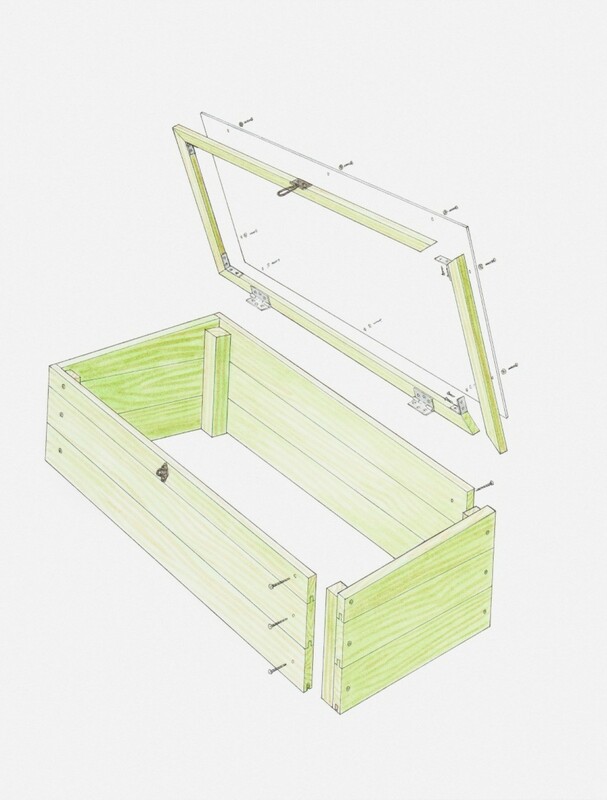 This guide is about building a cold frame. You can build your frame any size you like but remember, you are going to have to weed some so you need to be able to reach across it. Mine was 2 feet by 6 feet. Please read through all the directions before you start. Remember you are simply building a rectangle shaped box. 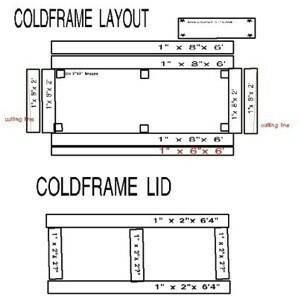 Lay out your frame by referring to the cold frame layout photo or pdf (below). Pre-drill the holes for your screws, two spaced evenly in the end of each long board. Notice two of the end pieces are 2 inches narrower on one end, that is to let water run off. 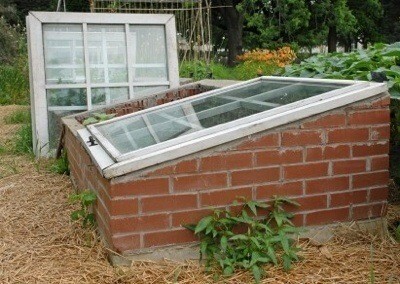 Decide on a spot for your cold frame that will get at least 8 hours of sun most days. Assemble your frame. 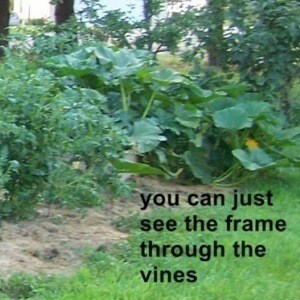 Move your frame to the chosen spot and dig the dirt out inside 2 1/2 to 3 feet deep. Put in a foot of manure and water it good. Put in the rest and water well again. Make sure it is good and wet, otherwise it will pull all of the moisture from the soil you will now add, and starve your plants. Add 6 inches of the soil you dug out of the hole and moisten. I mixed compost into my soil because we have a lot of clay in our soil. Your local Sale Barn will be glad to have you help them clean out their pens. Horse manure with the wood chips is great from stalled horses if you can get it. Next pound the 2 x2's in the corners, center front and back, screw in from the outside to secure. Now for the lid, Plexiglas is expensive so you may want to consider 2mm heavy clear plastic to go with. Wait until you get your lid built, and then measure to see what size you need. You will notice a question mark in the measurements of the short cross braces in the lid, which you may need to adjust for your frame. I chose to make mine hang over two inches on all four sides to assure unwanted water didn't get in. Also you may decide to go with plastic when you see the price of Plexiglas. Assemble your lid and attach with the hinges on the back of the frame. You will want to attach 1/2 of the chain or rope from each end of the frame to the lid to keep the wind from blowing it off. I also put a hook and eye on mine because, here in Nebraska, we get a lot of strong wind. You are ready to plant. There is no need to start your seeds in the house and you can plant before the ground is warm because the manure will warm your soil and the lid will trap heat inside the frame. If you are concerned, you can put Styrofoam insulation around the inside of your frame. Watch the temperature by your thermometer and prop the lid open for fresh air if it gets hot. Your plants need to get fresh air all they can, depending on your weather, open the box all you can to acclimate them. Keep the soil moist and transplant at the appropriate time for your area. Source: Helping my parents garden as a child was a great experience. Click here to download a PDF of the Coldframe Layout diagram. Using a cold frame is a great way to protect your plants from cold damage during the transition months on either side of the growing season. A homemade cold frame can work just as effectively as a commercial model, and you can build one yourself for a lot less money. Although building your own means you can make it as fancy as you wish, all you really need is a bottomless box, a transparent cover, and a location that captures as much of the sun as possible. The mechanics of how a cold frames works are simple. During the day the sun heats the air and soil inside of the frame, creating a favorable growing environment for your plants. At night, heat stored in the soil keeps the temperature inside the cold frame warmer than the outside temperature, and helps protect the plants from cold damage. Clear sheets of acrylic (e.g. Plexiglas) or fiberglass reinforced with wood strips. Heavy weight polyethylene film stapled to a wooden frame. Determining size: The size of the cover and framing materials you choose may ultimately predetermine the size of your cold frame - for example, if you're reusing an old window sash or you plan to use straw bales to construct the box. In general, try to keep the size of your cold frame to no more than 2 to 3 feet wide and 4 feet long. This will allow you to house a variety of plants, while still keeping them within easy reach. For strength, reinforce the corners of the box with vertical one-by-two inch posts, making sure the posts are flush with the top of the box. For added insulation you can line the frame with plastic, and seal the edges with weather-stripping. 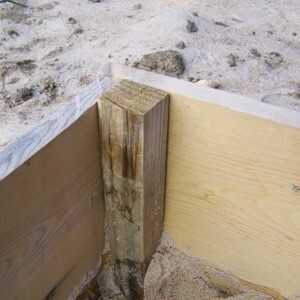 Wood frames should be constructed using galvanized nails. Use screws or hinges if you plan to disassemble the frame for seasonal storage. As a final step, place a thermometer inside the box where it will remain easily visible so you can monitor the interior air temperature. 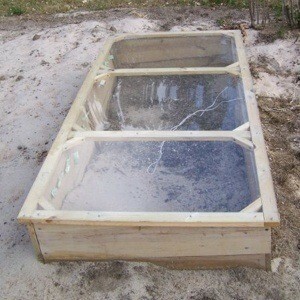 Place your cold frame over a garden bed in a location that is protected from harsh winds. Ideally, the site you choose will be close to your house. This will make it easier for you to monitor the plants and give you convenient access to water. For maximum sun, place it against a south-facing wall of your house, and orient it so the frame tilts to the south. If a southern exposure isn't possible, an east-or-west facing location is the next best choice. Ventilation: Your cold frame needs to be properly ventilated to prevent the air inside from overheating and killing your plants. As a general guideline, if a sunny day is in the forecast, prop the cover open a few inches in the mid-morning (or when the interior temperature reaches 70-75 degrees F), and close it again before sunset. If the forecast calls for an unusually cold night, insulate the frame by throwing a blanket over the top to help trap daytime heat inside. If you can't be around to monitor the temperature of your cold frame during the day, consider investing in a solar activated venting arm that automatically opens and closes the cover at a preset temperature. These devices are non-motorized and are available through greenhouse supply companies (and online) for as little at $40. Moisture levels: The plants in your cold frame should be kept moist, but not soggy. Depending on the weather, daily watering may be necessary, especially for seedlings or plants growing in small pots. Watering should be done in the morning so the moisture has a chance to evaporate before the cover is closed overnight. Spring: Use it to speed up germination and get an early start on cool season vegetables, or to harden off seedlings that were started indoors. Summer: Replace the cover with a shade cloth and use it as a nursery for rooting and propagating young plants. Fall & winter: Extend the harvest season by planting greens or herbs in your cold frame in late summer, or use it to over-winter bulbs intended for early-spring forcing.